Q: Do Sanden compressors contain refrigerant oil? A: Refrigerant oil is installed in Sanden compressors at the factory. Check the compressor label for the type and amount of oil. Q: Can I buy a compressor directly from Sanden? A: Direct sales from Sanden is only available via our website. Use the Find Your Compressor feature to find and purchase your compressor. Q: Where can I purchase a Sanden compressor? A: Sanden compressors are available through a network of distributors. Click here for a list of authorized Sanden distributors. Q: How do I identify the model number of a compressors? A: Look at the label on the compressor. 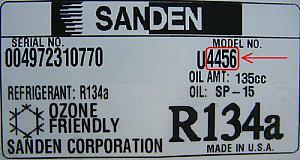 The Sanden part number is listed under "Model Number" on the label. The part number is a 4 digit number. Please disregard any leading alpha characters. See example to the right. A: No, Sanden does not believe that compressors can be rebuilt with an acceptable quality level. 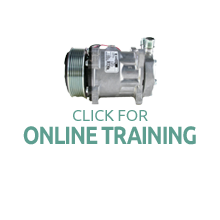 We recommend new, not rebuilt compressors when replacing a broken unit. Q: Is there a cross reference from a manufactures part number to a Sanden part number? A: Yes, there are many poor quality copies of Sanden compressors being sold. Please contact one of our authorized distributors to ensure that you are buying an original, high quality, Sanden compressor. Please contact Sanden directly if you feel you have been sold a counterfeit Sanden compressor. Q: Does Sanden offer replacement compressors for light vehicle that did not originally come with a Sanden compressor? A: Yes. Please view our "Application Look-up" to find compressors for light vehicle applications including those that didn't originally contain a Sanden. Q: Does Sanden still provide replacement compressors designed for a R-12 refrigerant system? A: Due to low demand, Sanden has discontinued R-12 models. This includes the following R-12 compressor series (SD505, SD507, SD508, SD509, SD510, SD708, SD709, TR70, TRF90, and TRF105). There are R134a replacements for the R12 models in most cases. Please contact one of our distributors for more information. Q: What is the warranty offered for compressors? A: Most customers that buy directly from Sanden receive warranty coverage on compressors. If you purchase compressors directly from Sanden, please view our warranty return procedure to understand our warranty claim process. Please contact your distributor to make a warranty claim if you do not purchase compressors directly from Sanden. Q: Will cooling performance improve if compressor speed or capacity is increased? A: Cooling performance could improve by increasing compressor speed or capacity; however, HVAC system capacity is not based solely on compressor capacity. Control algorithms, evaporator and condenser sizing, as well as a host of other factors contribute to system capacity, so simply speeding up your compressor or upgrading to a higher-capacity compressor will not necessarily increase your actual system performance. Please consider consulting an aftermarket HVAC systems company if you need help in upgrading your system. A: No, Sanden compressors are designed and validated for use on mobile air conditioning applications only.